I LOVE STAMPING and it's been my newest hobby to date. I started off using an acrylic block, then a clear plastic plate (yes, it works) but I always had problems lining up my stamps just right or getting a clear image. I figured I would get better at it with time but I knew I had a problem when I tried layering stamps. IT WAS HORRIBLE. The issues I had with an acrylic block were only magnified when I tired to layer. Issues with splotchy images, incomplete ink transfer and positioning layers were a nuisance. Then I found out about the Tim Holtz Stamp Platform. It changed the way I stamp. Now I can easily line up my stamps where I want them, close the platform door, ink up the stamps and have my images stamped exactly where I want them to be. If the ink didn't transfer all the way, all I had to do was open the door, re-ink the image and close the door again. It would stamp in the same exact place. If the ink was splotchy just re-ink, close the door and stamp over. I've wasted less paper and saved on frustration using this handy little tool. Each time I close the door the placement of my stamp is precise and right where I want it. The door even has two mini walls that won't let you press down too hard on the stamp to produce a bulgeing lines. Not only does this fix splotchy ink and ink transfer issues but it makes card making more efficient. I can put down multiple stamps with different colors and only stamp once. I can even mass produce the same card design on as many cards as I want. 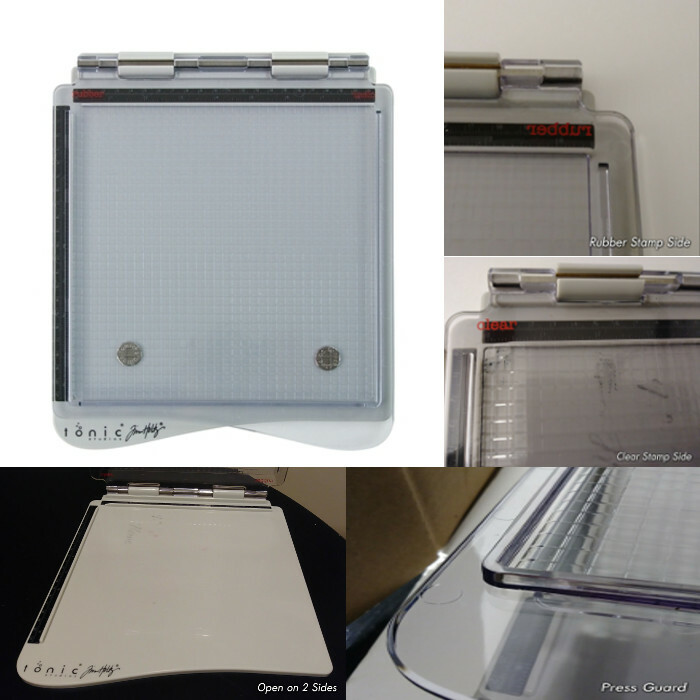 Even better, I can use this for rubber stamps or clear cling stamps by flipping the door over and it works seamlessly, no need for an extra piece to insert that will probably get lost in the craft stash. Each side is clearly labeled so you know exactly which side to use. The door also has a grid on it so there is no need to make special grid paper to align anything and the platform is open on two sides to accommodate all sizes of paper. Cleaning is a snap. I always clean my stamps off with baby wipes while the ink is still wet. That technique also works on the stamp platform. I didn't have to use any special cleaners and if I let the ink stay on a little longer than I should, a little bit of soap does the trick. I avoided getting this tool for a while thinking it wouldn't add any value to my ceafting hobby but it has quickly become my go-to tool. If you want to get the Tim Holtz Stamp Platform for yourself it is currently available on Amazon and Scrapbook Pal.